If you thought the market would rally once a trade deal was struck between the U.S. and China, think again. 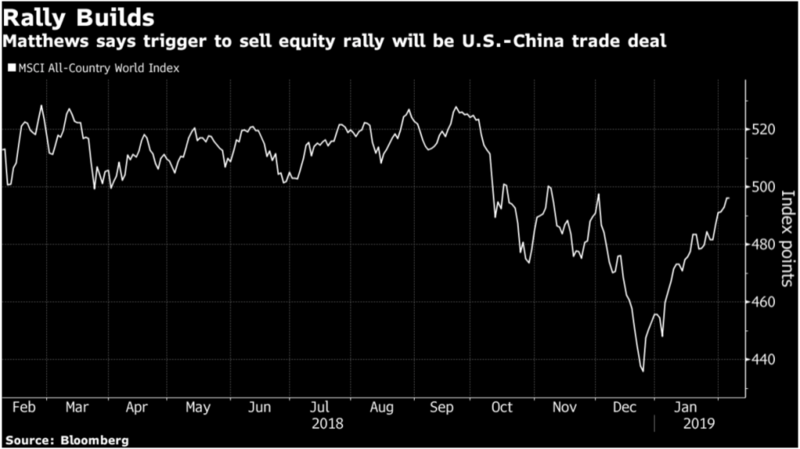 According to Shawn Matthews, founder of macro fund Hondius Capital Management, a trade deal between the two countries would end the rally in risk assets that’s been going since late December. Markets have been surging since late December as optimism builds around a trade deal being reached and a wait-and-see stance from the Fed regarding further rate increases, the latter of which was confirmed last week. Since Christmas Eve, when the S&P 500 slid briefly into bear market territory, both the S&P 500 and the Dow are up more than 16%, and the Nasdaq is up 19%. Matthews speculates that a trade deal may be struck just ahead of the March 1 deadline, which is when U.S. tariffs on $200 billion of Chinese imports rise to 25%, but the magnitude of the market’s reaction will depend on the details of whatever agreement is reached. U.S. Trade Representative Robert Lighthizer and Treasury Secretary Steven Mnuchin are heading to Beijing for the trade talks next week, which could pave the way for a meeting between the presidents of the two countries near the March 1 deadline. “You want to fade the rally into the deal – and that deal is probably going to be a watered down deal anyway,” Matthews said. He doesn’t see stocks heading much higher than where they are now as investors wrestle with slowing growth globally and the potential that interest rates could climb further this year, even as the Fed’s policy seems to be on hold for the time being.